It was a big weekend for GA Chess! Three GA girls completed as a team in the Under 18 Division of the National All Girls' Chess Championship and came home with the first place team trophy. 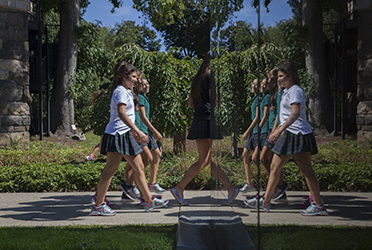 Greenwich Academy has been awarded the prestigious Edward E. Ford Foundation Educational Leadership Grant, valued at $500,000, to support the expansion of its groundbreaking Girls Advancing in STEM (GAINS) initiative. Three dynamics industry leaders, Tim Armstrong P '22, '24, CEO and founder of the dtx company, Lisa Utzschneider P '27, CEO of Integral Ad Science, and Stephanie Benedetto '98, CEO & co-founder of Queen of Raw shared their experiences and advice. Greenwich Academy is proud to announce that alumna Radhika Jones '90, editor-in-chief of Vanity Fair, will deliver the graduation address at Greenwich Academy's 192nd commencement. On Thursday, nationally-acclaimed Boston-born poet and rapper Oompa performed several of her pieces at an Upper School assembly. "App-Building for Good," was the theme of the third annual Middle School Hackathon. The team won a state championship, the STEM Research Award, and their advisor Doug Rendell was recognized as Teacher of the Year. They interviewed, they brainstormed, and they prototyped. They sawed, they programmed, and they wired. 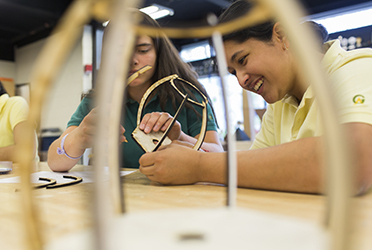 The Group V girls spent the months of January and February not only learning about the engineering and design process, but living it. Five submissions earned Gold Keys, qualifying them for the Scholastic national awards. For the fourth consecutive year, GA brought home the Patterson Cup. This is the program's thirteenth national championship. Anthony Ray Hinton spent 28 years on death row for murders he did not commit. "I wish I could say the State of Alabama made an honest mistake," he said when he spoke to Greenwich Academy and Brunswick upper school students last week, "But this wasn't an honest mistake. Race and class had everything to do with me going to jail." Every January, the GA community sets aside time to honor Dr. Martin Luther King Jr. and to discuss the lessons to be learned from his life and activism. The theme of this year's observance was "justice." GA senior Anisha Laumas has been named a top 300 scholar in the 78th Regeneron Science Talent Search—the nation's oldest and most prestigious high school science and mathematics competition. Math maven Scott Flansburg wowed a Lower School assembly with numerous tricks and magic numbers. Flurries outside the windows had the girls wondering if Mrs. King's office was an actual snow globe. Award-winning author Mitali Perkins recently visited Greenwich Academy and delivered three entertaining assemblies, addressing students in Groups III through XII. There was lots to like—and buy!—at this year's Middle School Craft Fair. The littlest GA students tag the newest Ridgeview building in indelible signature style. "Being a writer is a solitary endeavor, so it's a gift to be able to share my work with you," said poet Richard Blanco at the opening of Monday's Upper School assembly. But Mr. Blanco did more than share his work—he created a brilliant mosaic of his life through anecdotes, faded family photos, and of course, poetry. Ingathering, GA's decades-old Thanksgiving tradition brings together students and faculty for a school-wide celebration of community and service. Laurie Keller, bestselling author and illustrator of "Arnie the Doughnut," Potato Pants!," and more than a dozen books for young readers, spoke to PC through Group IV over the course of three assemblies on a recent sunny October day. Crisp fall weather, hot apple cider and a pizza truck helped energize the crowds cheering on the Gators for Wednesday's spirit day. "I'm always looking for ways to engage the community in our art installations," says Luchsinger Gallery Director Kristen Erickson of bringing Sol LeWitt's "Wall Drawing #797" to GA.
Life doesn't always go as planned, but that doesn't mean we can't find joy in the unexpected. Thursday's Parent Program speaker Pricilla Gilman, author of the memoir, "The Unromantic Child," has made this her mantra. Author Veera Hiranandani kicked off her fall book club tour with a visit to the Group V / VI book club, whose members have been eagerly reading and passing around copies of her new historical novel, "The Night Diary." Why are women underrepresented in fields like engineering, physics, economics, and music theory? What can be done to increase the representation of women in these fields? NYU developmental psychology professor Dr. Andrei Cimpian discussed his research on this topic at the 9th annual Greenwich Academy Symposium. Glass harpist Jamey Turner showed an appreciative GA audience how to make music from the mundane, playing everything from tumblers to tools. The League of Women Voters of Greenwich visited Greenwich Academy to register students, capping off a week of political engagement.